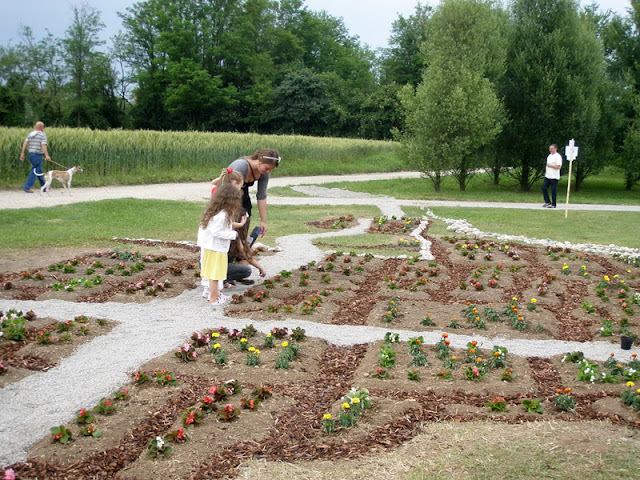 The Cassano d'Adda Garden Map is exactly what it sounds like. I recreated the small municipality of Cassano d'Adda, part of the mosaic of eastern Milan's provinces, with earth, pebble, rocks and plants. The map reproduces the town's grid, shaped by the river Adda on the east, and by Milan's first canal Naviglio della Martesana in the north. 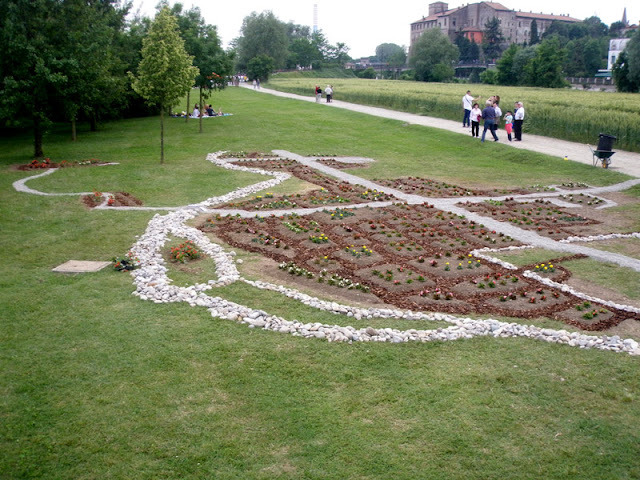 I carried out the project within the frame of Ecoismi 2012, a show in which 12 artists were invited to develop site-specific projects on Isola Borromeo, an island-park near the city center. 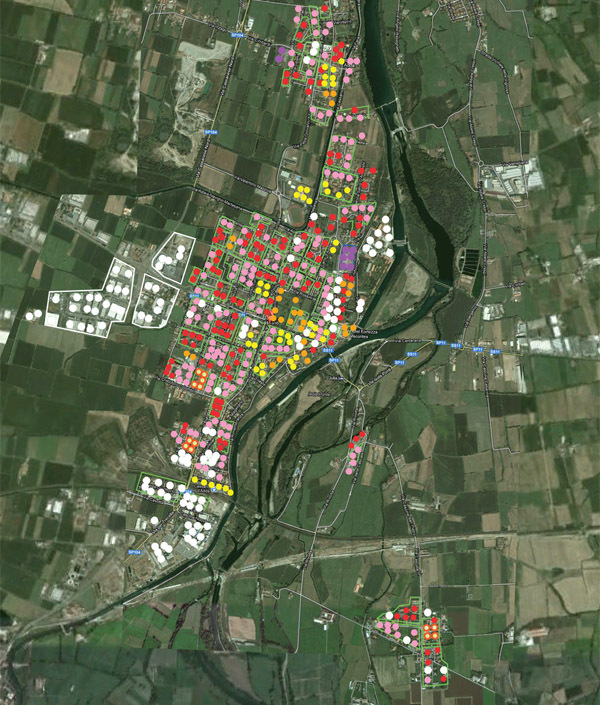 What I attempted to do with the Cassano d'Adda Garden Map is to bring to the fore several fundamental properties of maps as spatial devices, and the ways in which we experience them. Maps, independent of scale or function, are fixed — they freeze the physis (what Greeks called the "living sphere") into an immobile image. Generally, trees and vegetation appear as blots of green, and animal life is completely absent. Although cities are some of the most concentrated nucleui of life, they appear to be accumulations of inorganic structures. Following the reasoning of critical cartography, which has explored these issues in depth, I tried to highlight that Earth's surface is a lived one by maintaining this fundamental property in a living map. This is a structure dependent on weather conditions and seasonal changes, and — most importantly — one that continuously grows and changes. The plants and raised flower beds give the map a vertical dimension that is uncommon in maps, but which is fundamental to cities. The size of the map allows visitors to physically enter and circulate within it. Since there is not an elevated viewpoint in its surroundings, the Garden Map cannot be fully embraced from a single perspective. This incites a spectator to move, traverse it, make circles around it — thus, he or she is no longer a spectator, but something of an explorer. Thus, the map is also a landscape. It uses life forms to indicate living forms, and earth to indicate manmade transformations upon the soil. 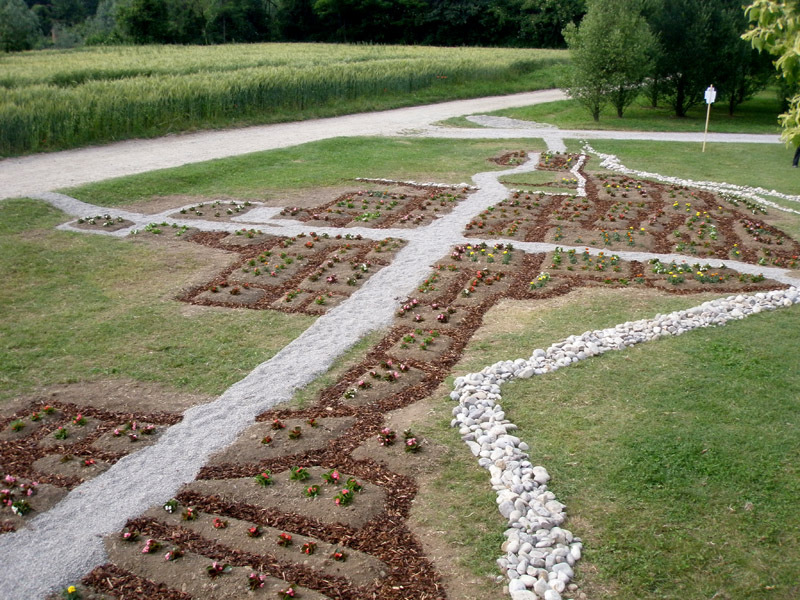 But we should not forget that the Garden Map is not only a representation but also a functioning ecosystem unto itself. Subsequently, should the spectator desire, he or she may become a gardener/mapper. This is because if the garden is to remain green and flourish, it needs people's participation and engagement. 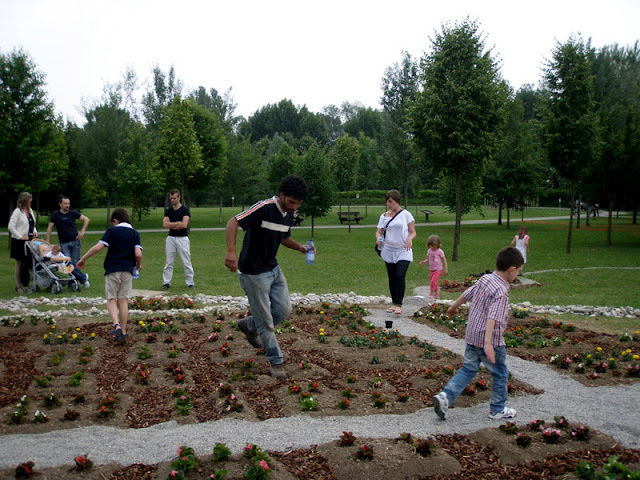 A casual visitor can water the Garden Map spontaneously by following instructions on a nearby sign. Otherwise, gardening visits can be scheduled online. The current Garden Map, as seen in these images, is in its infancy. Empty "lots," mainly in the map's residential areas, are invitations for gardener/mappers to act by planting a “tag” to indicate a spot important to them, such as their house or workplace. Hopefully, the map will eventually sketch possible further developments of the city or gain a fantastical dimension. 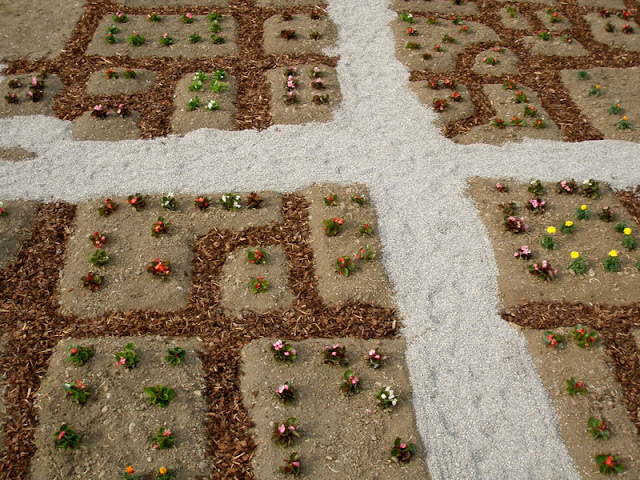 To paraphrase Henri Lefebvre, the Garden Map, like any social space, needs to be continuously produced and reproduced. Because it is part of a larger ecosystem, the Garden Map is inhabited with less expected or welcome citizens of different species: weeds. 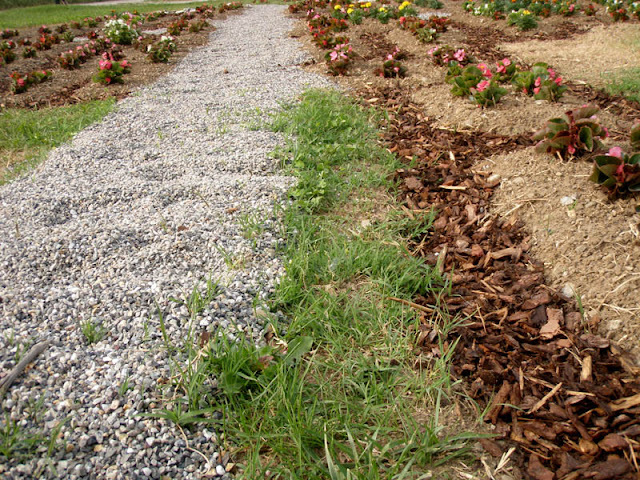 Since the garden is also a community, or a polis, getting rid of the weeds directly leads to the problem of policing the city, exerting control over different cultures within it. Could different types of plants, each with very different lifestyles (nourishment, expansion, water needs) coexist successfully? The “right to the city” is a complicated affair, even in a seemingly simple system such as this. More than being graphic symbols for buildings, the plants signify what citizens do during the day and where they do it. On the other hand, the fact that they are rooted in the terrain reminds us of a peculiar function that some plants (mainly trees) have performed for millennia — they act as landmarks. Plants may be the first architectures known to the man, and they served as major reference points for movement and settlement. Iconically speaking, they blur the distinction between built environment as something inorganic, and lived (and living) environments as systems — ecosystems — which our cities essentially are. It was amazing to discover that, even by laying out just 700 plants or so, we can produce a city representation that merges some of the critical properties of maps and landscape. In this mash-up, the convergences and divergences between the two systems become palpable. I wonder: Could this experiential knowledge have implications for our everyday practice in linking maps and cities? Mirko Nikolić, an artist based in Belgrade and Milan, paints cartographic landscapes of globalizing networks. He also keeps a blog called Point Line Flow. Credits: Photos by Mirko Nikolić.